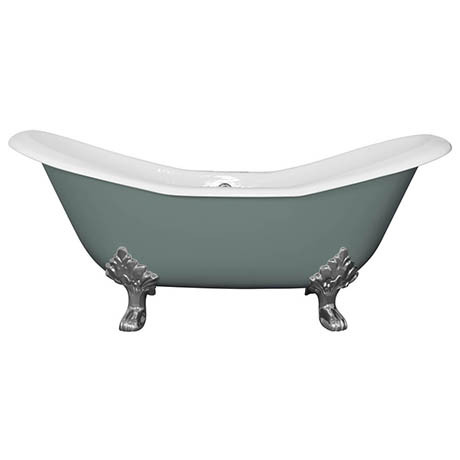 A large cast iron roll top double slipper bath from JIG is the ultimate choice to give a bathroom a stunning traditional centre piece that transports you to a bygone era. The baths are cast using traditional casting methods in a foundry, the enamel coating is then applied using the latest glazing techniques. All of the Cast Iron Bath range from are available in a stunning range of different colour finishes at no extra cost, Due to this custom nature of this product & custom painting, each product has an estimated 2-3 week lead time. The bath is also available in a Prima black finish if you prefer to colour yourself. On placing your order we will contact you to confirm which painted colour finish you require. View available colour options in product additional images. Due to the enameling process, there may be a few pin holes and sometimes minute black specs in the surface of the material all of which add to the character and the design of the bath. You cannot cancel your order once bath has been painted.